so hito and i have been through a bit of drama this weekend (notice that emile is still not using his own body). i’ll be talking about that soon enough. so to comfort the boy i forced him to wear the most ridiculous necklace i think i’ve ever made. 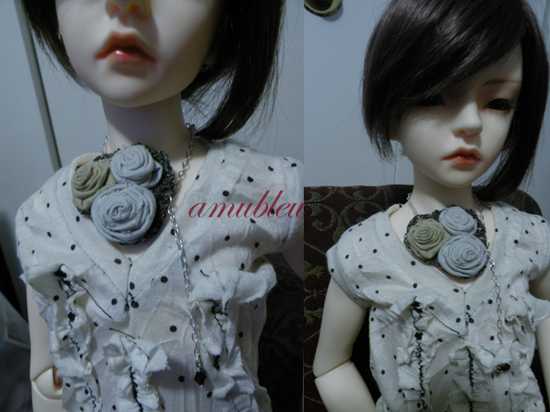 i was fooling around with some scaled down cloth flowers this weekend and was inspired to make a few romantic/deconstructed style necklaces(i’ve been reading way too many japanese doll blogs latelyO_o). i made these out of some distressed cotton that i had as left overs from other projects. i backed each flower with some crocheted stainless steel wool lace weight and strung everything up with a little silver chain. there is even a garnet color crystal hanging from a chain off the flower but it may be hard to tell. i have a few other flower styles that i’m going to try so we’ll see what i’ll have later.